It was just five months ago that Apple speed bumped the iMac G5 by 200 MHz, and yesterday it upped the ante again. The Late 2005 iMac G5 is thinner, lighter, faster, and more feature-laden than its predecessor. On the innovation front, the October 2005 iMac is Apple’s first computer to use DDR2 memory. It’s also the first Mac to use the PCI-Express bus for video. Rounding out firsts, the new iMac is the first Mac with a built-in webcam and the first to use ATI Radeon X600 graphics. Following in the footsteps of the original iMac, which was the first desktop Mac with no room for an internal floppy drive, the newest iMac has no room for an internal modem. Value, as always, is better than ever. The entry-level 17″ 1.9 GHz model includes a SuperDrive, built-in iSight, Radeon X600 Pro graphics, and Apple’s Mighty Mouse for $1,299 (all prices in US dollars) – the same price as the Combo drive 1.8 GHz May 2005 model. At the top, the 20″ 2.1 GHz model includes Radeon X600 XT graphics. Oh, there’s also a remote control. And you can go to 2.5 GB of RAM, not just 2 GB as with previous G5 iMacs – probably not a big deal for most iMac buyers. If you were at all tempted to buy an iMac plus an iSight webcam, the value is obvious. If you’re still using dialup, though, there’s an extra $49 charge for Apple’s new external USB modem. Prices for the May 2005 iMacs have plummeted. Club Mac is pretty representative – 17″ 1.8 GHz Combo iMac G5, $999; 2.0 GHz SuperDrive, $1,099; 20″, $1,499. Apple has simplified things by eliminating the Combo drive iMac – it’s not even a build-to-order option. If you don’t have any use for a SuperDrive, you can save $300 with the 1.8 GHz Combo iMac. That’s a good value, and even if you add an iSight webcam, you’re still $150 ahead. If you want a SuperDrive and don’t care about iSight, the 17″ 2.0 GHz model will save you $200. But add Mighty Mouse or a modem, and it’s not compelling. If you want a SuperDrive and iSight, buy the new iMac. There’s also a $200 difference between the new 2.1 GHz 20″ iMac and the 2.0 GHz model it replaces. If you’re leaning toward a 20″ iMac plus iSight, definitely get the new one, and you’ll have Mighty Mouse thrown in as well. If you want a 20″ iMac and need to use a modem (either for dialup or faxes), then the 2.0 GHz model becomes the better value – so long as you’re not tempted to add iSight. In general, when comparing the October 2005 iMacs with the May 2005 models at close-out prices, the new models offer better value. I haven’t bought a new Mac since the 400 MHz PowerBook G4 first shipped in January 2001. Everything since then I’ve picked up refurbished from the Apple Store or used. Refurbs have the same warranty as new, and you can add AppleCare if you want to lengthen your warranty from one year to three. You also save a bundle! We did our iMac G5 price tracker on Tuesday, and prices ranged from $899 to $1,499. With the advent of the new iMac, Apple has slashed those prices. That’s anywhere from $150 to $300 difference. Look at it this way: Yyou can buy a refurbished 20″ 2.0 GHz iMac G5 for the same price as the new 17″ 1.9 GHz model. Bigger screen, mostly similar specs, no internal webcam. Or look at the 17″ 2.0 GHz model at $949, $350 less than the new 1.9 GHz model. Pretty similar specs, no webcam, big savings. Sure, you’ve got better video, DDR2 memory, and iSight with the new models, but just look at how much you can save. I’d have a hard time justifying $1,699 for the new 2.1 GHz 20″ iMac when I could buy the 2.0 GHz model for $400 less. iSight plus Mighty Mouse only eats up half that difference. The new iMacs are nice, but the real value is in refurbs – while they’re available. All things considered, I’d call the 1.8 GHz 17″ SuperDrive iMac at $799 the hottest value. It’s now two generations old, but that’s plenty of power. And that’s what Apple was charging for a new Combo drive eMac earlier this week. Speaking of the eMac, after four years and four revisions, it’s time to kiss the great white whale good-bye. Although Apple is still selling the eMac on the education market, they’re no longer offering it to the general public, and when the various Apple retailers run out of stock, that’s going to be it. We have mixed feelings about the eMac. We liked the value. You could buy a new SuperDrive eMac for $999 or a Combo drive iMac for $1,299. Until the Mac mini arrived in January, it was Apple’s most affordable desktop computer. On the downside, it was huge and heavy. We know, because we’ve used them. Still do. There’s a good level of power in there, but the CRT monitor has its drawbacks. Like we already said, it’s huge and heavy. No resolution above 1280 x 960. And turning up the eMac’s volume can make the screen shimmer. 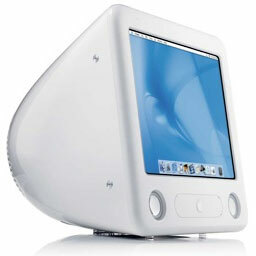 With refurbished minis as low as $399 and G5 iMacs as low as $749, it’s an appropriate time to retire the eMac.